Every place I have ever lived (Arizona and Texas) is still relatively warm around Halloween. Carving a pumpkin early in October leaves you with a nice moldy mess about half way though the month. And as much fun as it is to carve pumpkins again, we don't always have time or want to fork out the money for a second set of pumpkins (since it is a tradition that we each get to carve our own). 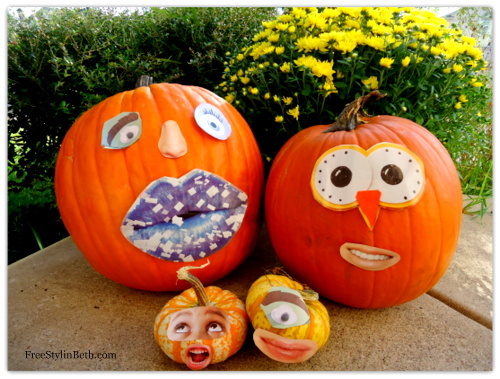 I love this fun idea that Beth shared for making rearrangeable pumpkin faces for your jack-o-lantern. Not carving the pumpkin will allow it to last longer, but the kids can still have some Fall themed fun. Then when we get to the week of Halloween, we can do the actual pumpkin carving. You can check out Beth's no carve pumpkin faces over at Or So She Says.